Made in a facility that also processes milk, soy, sesame, egg, peanuts, tree nuts, fish/crustaceans/shellfish oils, and wheat products. Natural and artificial flavors, sucralose, silicone dioxide, citric acid, malic acid. Malic acid, Natural and artificial flavors, Sucralose, & Citric acid anhydrous. Consult your physician before using this product if you are taking any medications or under a physician’s care for a medical condition. Not for use by those under the age of 18, women that are pregnant, trying to get pregnant, or nursing, or those that are sensitive to caffeine. Too much caffeine may cause nervousness, irritability, sleeplessness, and, occasionally, rapid heartbeat. 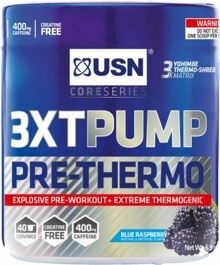 One serving of 3XT-Pump Pre-Thermo provides 400mg of caffeine, which is the equivalent of four cups of coffee. Do not consume caffeine/stimulants from other sources or within 4 hours of bedtime. USN 3XT-PUMP ALL-IN-ONE PRE-WORKOUT is the ultimate pre-workout amplifier. * Developed to help provide you with the focus, energy, strength and power levels needed to push you through each workout session.